This rarely happens to me. You know, when you first taste test a cupcake and then fall in love at first bite. In fact, I'm convinced it's the best vanilla cupcake like, ever. And being myself, the ever experimental baker, I wanted to find another vanilla cupcake recipe that's fail proof with an authentic vanilla kick. 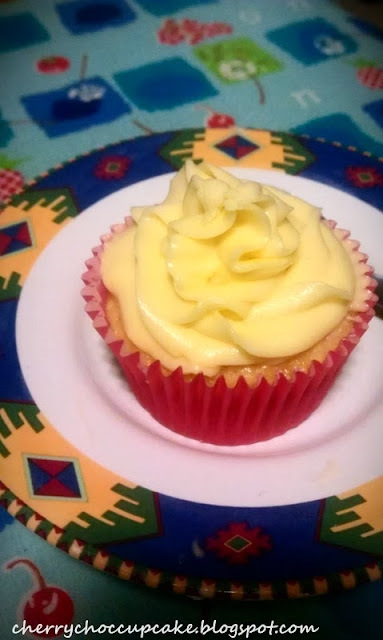 So within my 2 years of baking, I've tested many vanilla cupcake recipes I dug out from the internet but this one from Cupcake Project's popular Vanilla Cupcake recipe is certainly crowned the best above the rest. It's got a super soft crumb that melts into your mouth with a true vanilla flavour that's hard to beat. I'm not exaggerating, its the truth. And I strongly suggest you try it, if you haven't already. Mum: "I want something with white chocolate"
Me: "Like a chocolate cupcake with chocolate frosting?" Mum: "No....WHITE chocolate not the one from cocoa beans"
Actually, after the conversation I decided to change it to a vanilla cupcake with white chocolate frosting, as I figured it would be too much of one ingredient. With the white chocolate frosting, I landed into this recipe from Not So Humble Pie that A: involves cream cheese and B: has lots of white chocolate. Perfect. I am quite aware of the effects cream cheese has on piping, but I like that its tangy flavour cuts out some of the sweetness. Unfortunately it came out super sweet, I guess loads of white chocolate + icing sugar = SWEET HEAVENS. So, to solve the problem, I dabbed a little icing on the cupcake and was randomly hit with a brilliant idea of covering it with sprinkles. I mean, who doesn't like sprinkles? It screams fun and celebration when you look at it. It reminds me of the epicness that is fairy bread from my childhood really.